Jumping up to kick a small doll and land on one foot... the record "kick" set Saturday night was more than 7 feet! Saturday night we were invited to come up to the Netsilik K-12 School [HYPERLINK "http://www.polarnet.ca/~netsilik] by the great local teachers Peter and Deborah McQuire. Also there were exchange students from here and the ones visiting from British Colombia that we talked about in the last report. They were having a night of traditional Inuit games. With the long dark winter up here, Inuit games are plenty and have a very strong tradition. Most of them are focused upon strength. In the past, the games were intended to keep hunters in shape and practice training skills to be used on the land. 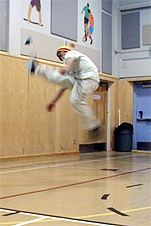 Our favorite game is the "One-Foot High Kicks.” This is really an attention getter as it demands a high level agility. A rolled up piece often a piece of seal skin, but in this case a little seal doll, is tied to a string and hoisted gradually higher while the competitors take turns kicking it. Three attempts per turn is allowed. You are suppose to jump with both feet, kick the suspended object with one foot, then land with the same foot while keeping the other foot of the floor. The record kick in the Arctic is more than 9 feet!! It's a small world... Natalie in the middle practicing sewing traditional Inuit slippers had already heard about us before meeting us. Her mother is a teacher back in British Columbia and her class is participating in Arctic Blast! After a great night, we decided to all meet again Sunday where we and Cola gave a small presentation before we would all indulge in learning a few Inuit crafts. It was really a neat experience to talk to these students. This exchange program is sort of a live version of this whole program! Visiting each other’s part of the world, presenting your own town or community and living with different family is the perfect opportunity to get a rare insight as well as an understanding and appreciation of different cultures. We had great discussions of how we impact each other in the south and the north, environmental policies, and how much we are all alike! Later in the afternoon the students had agreed to help us out, working on the computers while Gordon - our photographer - got to snap a ton of great images. Gordon was to fly out that afternoon, but that never happened as a major storm was brewing and moved in over town in the late afternoon. Today we went back at school, to talk to the rest of the students and also to see the exchange students off as they were to head out on the land to go camping for a couple of days. But the storm that raged overnight had been so severe that it almost shut down the whole community with huge drifts and deep snow in the streets. They decided to wait a little bit and watch the weather before heading out. Today is really weird weather, cloudy, exceptionally warm and almost raining. Tomorrow, they are promising another raging storm though from the other direction!! Gordon’s flight was also canceled today. We wonder how long Gordon is going to be stuck here!? Luckily, we "parked the dogs" in the very protected harbor area so they are okay but we have to admit we are happy we are not sitting in the tent these days. We are being told this is the most extreme weather, snow and storm they have had here in the Taloyoak area all winter!! Guess spring is playing tag with us. But as an elder told us yesterday, the locals have not seen any birds from the south yet - which is considered the true sign of spring. Paul actually saw one last week when in Gjoa Haven and even though it is the only one so far. It makes us all grin! Being the best ptarmigan hunter Choko earns the Polar Husky Star of the week. Choko is with his dominant nature, high speed, and obvious intelligence our best point dog. Running on Paul's team he can also lead, though lately he seems to prefer leaving that turf to his mother, Cola and sister Freja. Choko loves attention and some of you in the US have met him as he has been traveling a lot with us visiting schools. The arrival of birds always has been and still is greeted with great joy up here. The first sighting of a snow bunting is considered to be an important event indicating that other birds will follow shortly with warmer weather. The Inuit traditionally have great respect for birds, appreciating their song and beauty, also the incredible strength and ability of the birds that live here year round or migrate here to spent the summer from the most far away places on earth. The only birds tough enough to actually survive arctic winter and stay up here year round are the “brainy” ravens, powerful snowy owls, and tough ptarmigans - though in years with lots of ptarmigan the uncommon gyrfalcon, the largest of all falcons, is known to also stick around. The dogs love these birds! Sometimes we are followed by the same Raven for miles all the while “talking” up a storm which the dogs find quite exciting. But their favorite is, without a doubt, are the ptarmigans. They will gather in large groups eating what little they can find on the tundra. They are pretty hard to sight being almost totally white, and as you get closer, their philosophy is to "hug the ground" so that we will not notice them. Sometimes it actually works, and not until we have already passed do we realize that there was a group of them. But most times the dogs have a blast as out of nowhere the land becomes alive in feathers and shrieks with ptarmigans SUDDENLY jumping straight up in the air and flying close to the ground right at nose level! 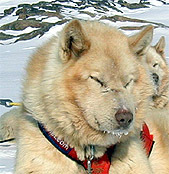 Choko, the Polar Husky star of the week - is THE ptarmigan hunter of our group. A beautiful and handy bag for sewing stuff made out of a loon skin. The local bird life around Taloyoak includes raven, seagulls, jaegers, and ptarmigan. Gyrfalcons apparently nest quite close to the community and snowy owls have been seen on the outskirts of town. Very soon HUGE flocks of ducks and Canada geese also fly over the community on their migrations[atoz/journey south]. Other birds coming north are sandhill cranes, gyrfalcons, short-eared owls, rough-legged hawks, golden eagles, tundra swans, king eider ducks, black guillemots, alcids, red-breasted merganser, harlequin ducks, and many more (But their are NO penguins in the Arctic). Last year a red Robin was seen on Baffin Island! Try and take a look on your local birds and you might be surprised to find that they will be heading north to our part of the world any day! Birds are traditionally a very important part of survival for the Inuit because they make full use of the birds they catch - using feathers, bones, fat, tendons, and feet of the birds for various things. Of the birds migrating north, the most important to the Inuit is the geese. They arrive by the tens of thousands. Chances are they are probably flying over the northern US and lower Canada these days. Have you seen them yet?? The only birds from the south that Mille has seen so far when visiting the Netsilik School! When it comes to long distance flying, though, nobody does it better than the arctic tern. After its nesting season, at the end of each summer, the tern leaves the Arctic and flies south - way south - to Antarctica at the other end of the Earth!! Arriving there, it spends the next four months fishing amongst the icebergs in Antarctica. Then, as winter returns to Antarctica, it flies all the way back to the Arctic to enjoy the northern summer. In a single year, an arctic tern may fly between 30,000 miles (50,000 km)!!! This is farther than any other animal is migrating on earth. With a life span of up to 20 years, it means that in a lifetime, this small bird will fly the same distance between the Arctic and the Antarctic as if it were to fly to the moon and back! Incredible eh'. Now, that puts our little journey in perspective. On Wednesday - if the weather holds - we will load the sleds and head back out. We have spent evenings with the locals going over the best route from here to Resolute. It is not an easy stretch ahead of us. With more than 400 miles to Resolute we will have lots of difficult traveling crossing land and ocean. Just north of here we will enter into a long stretch which takes us through what is considered one of the most densely populated polar bear areas. We should see lots of seal when on ice and possibly face some of the larger herds of musk ox when on land. As we approach our next destination, we will face the challenge of crossing Barrow strait. But heads up, the dogs are as ready as ever and so are we. We will continue to head north - just like the birds!